I just had the opportunity to review the most recent release, Miles To Go, from Colin James and it's really good! 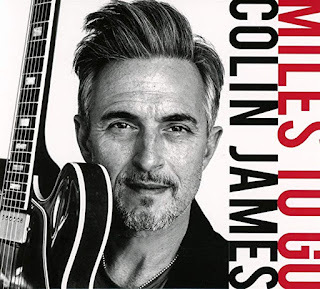 Opening with Muddy Water's, One More Mile, Colin James puts a funky spin on it and it is a contemporary as they come. With Geoff Hicks on drums, Steve Pelletier on bass, Simon Kendall on Hammond, Chris Caddell on rhythm guitar and Steve mariner on harp, this track is a super opener. Another Waters track, Still A Fool maintains the basic Waters outline but with a solid bass line and fiery guitar riffs, another super addition. Very nice. Big Boy Crudup's Dig Myself a Hole has a super Little Feat, swampy funky feel with real nice slide by James and perfect backing vocals by The Sojourners. James original. I Will Remain, is really solid with a real nice drum track, glistening rhythm guitar, a soulful melody and excellent blues guitar lines bringing to mind BB King or Robert Cray. Excellent! Jessie Mae Robinson's Black Night is my favorite on the release with James' best vocals on the release. His guitar riffs are inspired and Chris Gestrin's piano work is crisp. Wrapping the release is an acoustic take on One More Mile with James on acoustic guitar and vocal with Coleen Rennison on backing vocal. This is a really nice closer for a very nice release.